At home I wouldn’t necessarily call myself an outdoorsy person. I’m not awful, I don’t drive to my mailbox or anything, but I also don’t seek out nature per se when in the confines of my comfy, suburban bubble. When I travel though I turn into a different person, I become an adventure seeker, explorer and nature lover. That doesn’t mean it’s all rainbows and puppies though, since I don’t often find myself trekking through rainforests that means I’m not always prepared for the experience when it does happen. One such adventure happened in Maui, but instead of a disaster, it became a cherished moment of introspection. 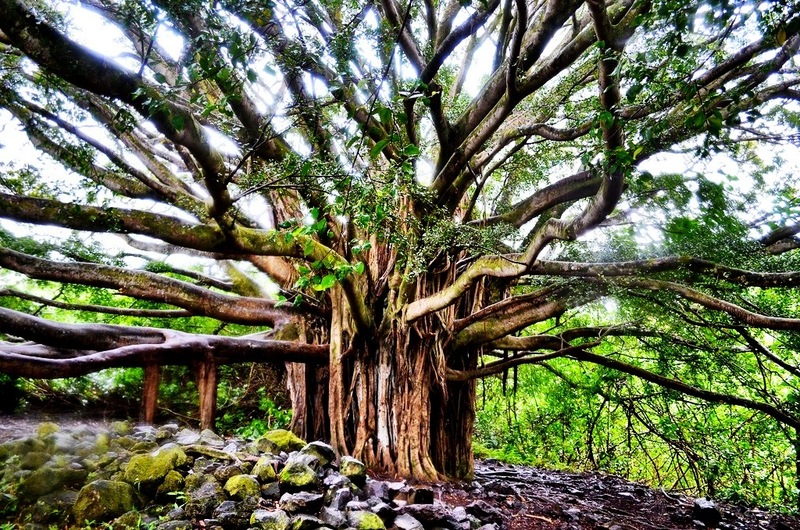 People sometimes get confused because the Haleakala National Park on the beautiful island of Maui is split into two parts. The part most people know is the summit of the mighty volcano, soaring 10,000 feet into the air and from which it feels as if you’re walking on clouds. 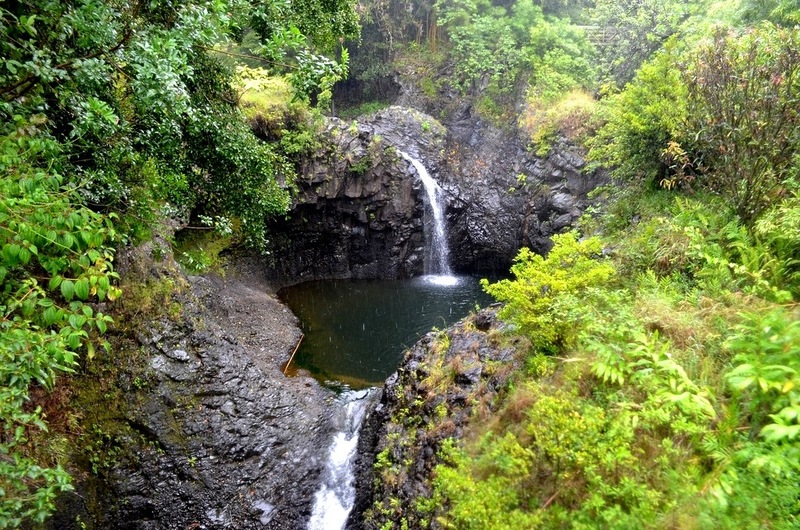 However, there’s another section of the park about 12 miles from the heavenly town of Hana known as Kipahulu. This is the coastal area of the park and features some popular trails and activities, including the natural bathing wonder the Seven Sacred Pools. I surprised myself though when I opted not for the safe and easy pool walk, but the more formidable, 4-mile hike on the Pīpīwai trail. The trail was never anything I thought about doing but the night before at dinner the communications manager at the Travaasa Hana Resort convinced me to give it a try. 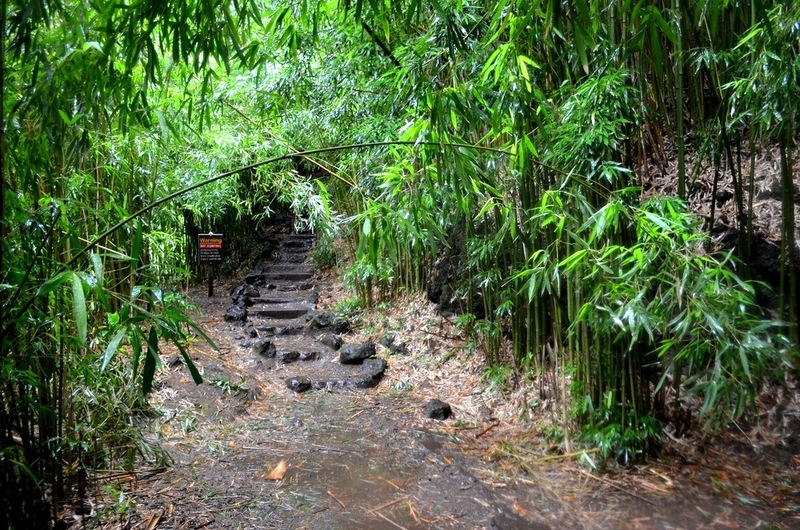 He painted a picture of lush rainforests, stunning waterfalls and a veritable cathedral of bamboo trees. I checked my schedule and decided that the trail experience was more interesting than learning how to make leis (sorry lei makers) and quickly, and without any research or forethought, I made my decision to hike the trail. 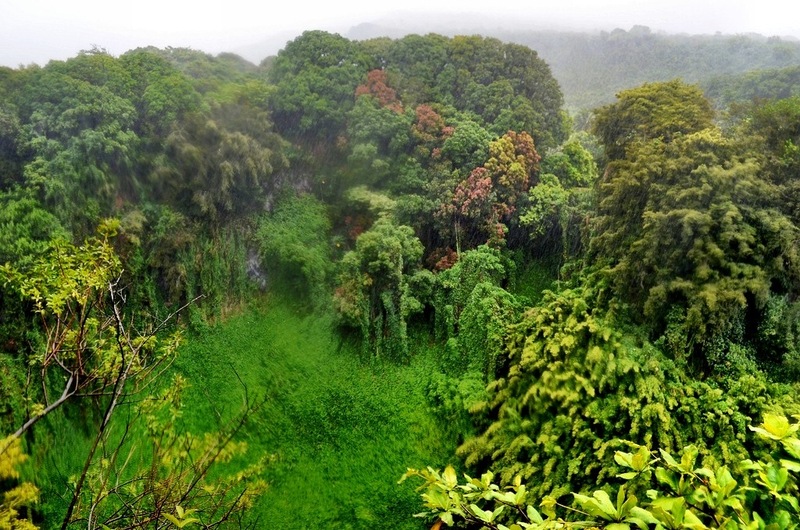 The area around Hana is gorgeous, featuring more shades of green than I think have even been identified. It’s green though for a reason, it rains a lot. A whole lot. As in hundreds of inches of rain per year. Yeah, I wasn’t prepared for that at all and found myself mildly shocked when a light rain started to fall as I pulled into the lot at the Haleakala National Park. I availed myself of an incredibly crappy $3 poncho I found at the gift shop, took note of the arrow sign pointing towards the Pīpīwai trail and took off. At first the rain just sprinkled a bit, but within minutes it was an outright downpour. I spied several felines and canine cousins falling from the skies, I’m sure of it. I had the poncho, so that was something, but my bag with uber expensive camera equipment remained unprotected. I panicked and created a hole in the poncho to cover the bag with the net effect of looking like a malformed condom, or a plastic hunchback. Although I was soaking wet, the trail was indeed beautiful. Everything, and I mean everything, was a rich green and I could hear the gentle roar of water gushing nearby. After a while I crossed a bridge that featured a stunning waterfall view, and I wondered if this was it. I hadn’t seen the famed bamboo forest yet, so I was dubious and a look at a nearby sign indicated that I was at the halfway point. I had a decision to make. Do I continue trekking along slippery rocks in the pouring rain or do I turn back? When I travel I believe I have to push myself for the extra cool experiences and so I continued on, making sure my camera wasn’t completely waterlogged. Along the way I met a few people, but not many. It was mid-morning and most of the tourists were still finishing up their spam and eggs breakfast. I was grateful for the time alone, I needed it. Just as I had this thought I turned a corner and the light suddenly evaporated, distilled by a seemingly infinite number of bamboo trees each reaching high to the heavens creating a natural roof. 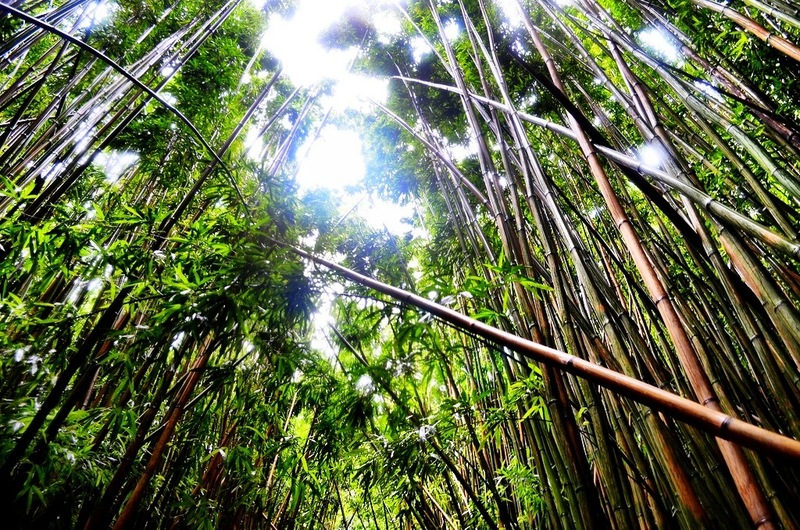 I was in the bamboo cathedral. It was amazing. I walked through slowly, never wanting the experience to end thinking about my life at that time. A lot had happened very fast and there hadn’t been any time to process it. I lost my job and was at a crossroads. Do I return to the corporate world, which guaranteed security, doing a job I hate? I had responsibilities and at the time it seemed like folly to chase my dreams. I felt selfish and irresponsible. But then I stopped and looked around at the trees, the rain filtering through and the rays of sunshine creating an effect that can only be called supernatural and I thought yes. Yes I would pursue my dreams because I love to travel. I love to travel for pristine moments of joy and happiness like the one I was lucky enough to experience in the middle of a rainforest with no one else around. It wasn’t a luxury or fancy moment, it wasn’t being wined and dined, it was a very raw and natural experience and it shook me deeply. 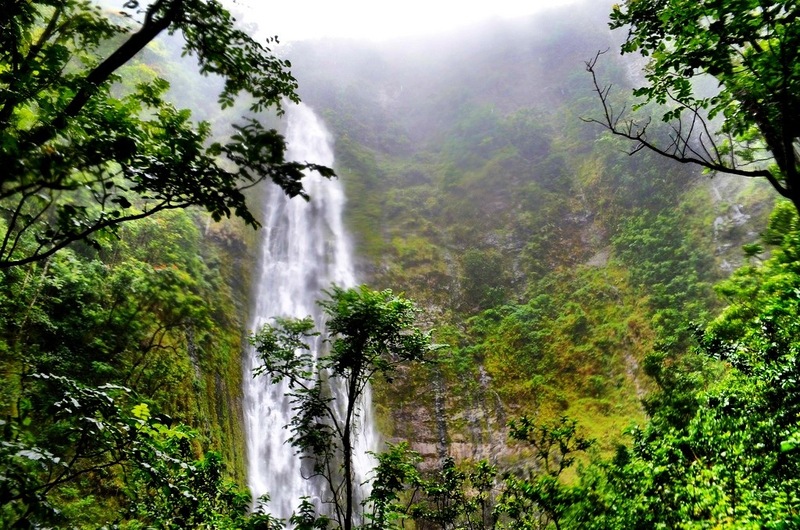 I eventually did leave the bamboo forest and did finally discover the main objective of the mission that morning, the 400-ft Waimoku Falls. The power of the falls shocked and intimidated me as I scooted along rocks and forged waist high waters for a better look. I sat on a log near the falls, taking photos and eating a PowerBar and just smiled. This is my life now and everything about it just feels right. That tree photo in the middle of your post is PHENOMENAL! Haha, I was just about to say – the tree looks like some kind of monster with multiple arms spreading in different directions. Would be great to see it on day! I really enjoyed the walk, Matt! You know, sometimes the rain makes all the difference – it could’ve been a less memorable experience if it was sunny. У нашей компании нужный портал с информацией про сео продвижение.